The most requested subject that my students want to learn to paint and draw is a cat. 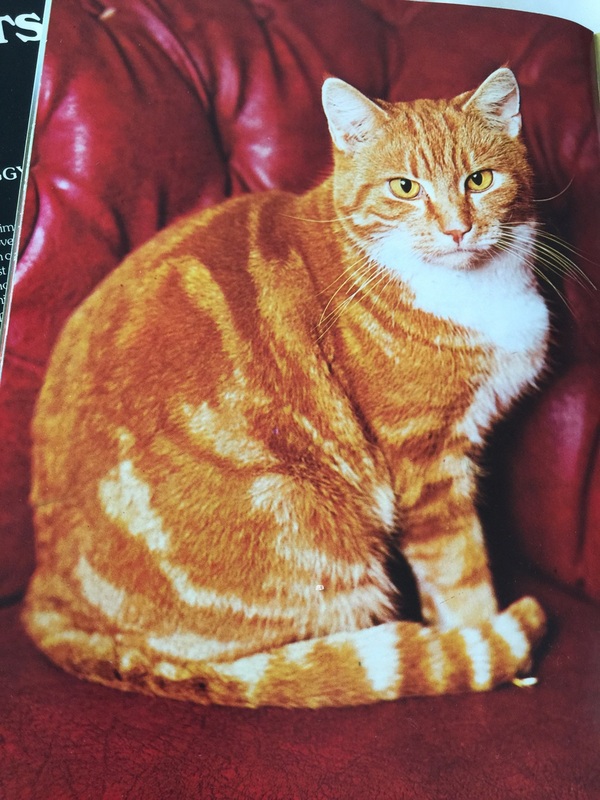 I thought I could review lessons 1 and 2 and teach you lesson 3 by using a cat as our drawing subject. 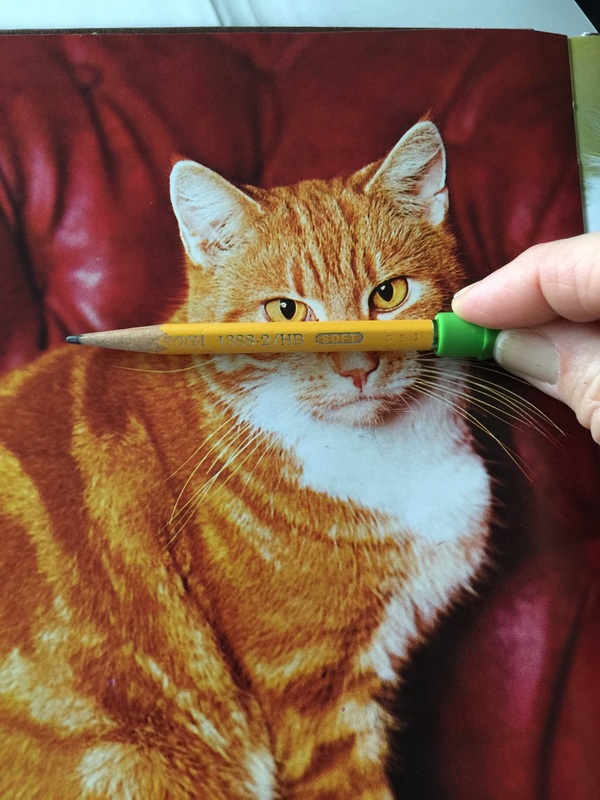 It's especially easier when drawing a cat to use a photo because cats move move around too much when you are trying to draw them. Start your drawing by finding the basic shapes and drawing them with a light pencil line on your paper. The next step is lesson 2, find a unit of measurement (I am using the height of the photo cats head). I measured the number of head heights in the photo cats height and width. Then adjusted my drawing (below) and marked the number of head heights in the length and width of the drawing to get the correct proportions in my sketchbook drawing. Lesson 3 is learning how to use guidelines to get everything to look good. The vertical line above helps me see that the chest touches this line but the side of the head does not. 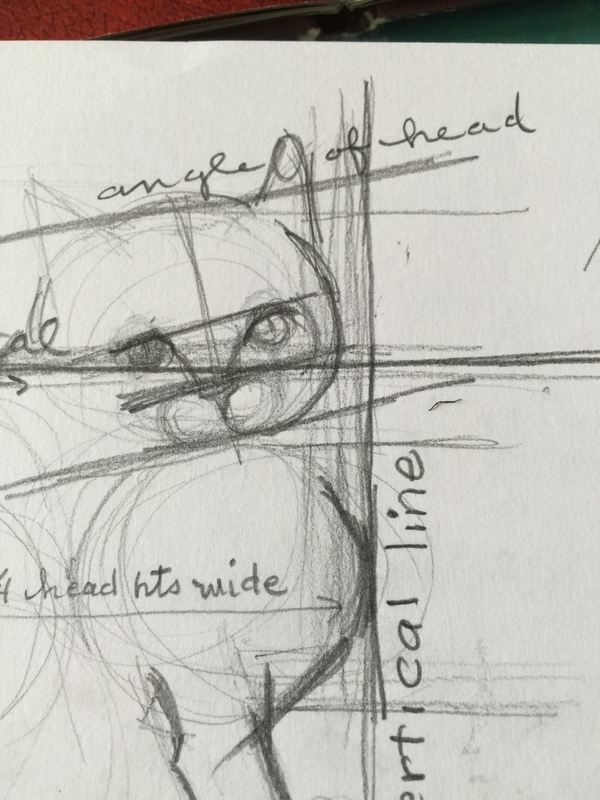 The next line I measured was a horizontal line on the tallest part of the cat's back to see where it intersected his face. Then I drew this on my cat drawing. 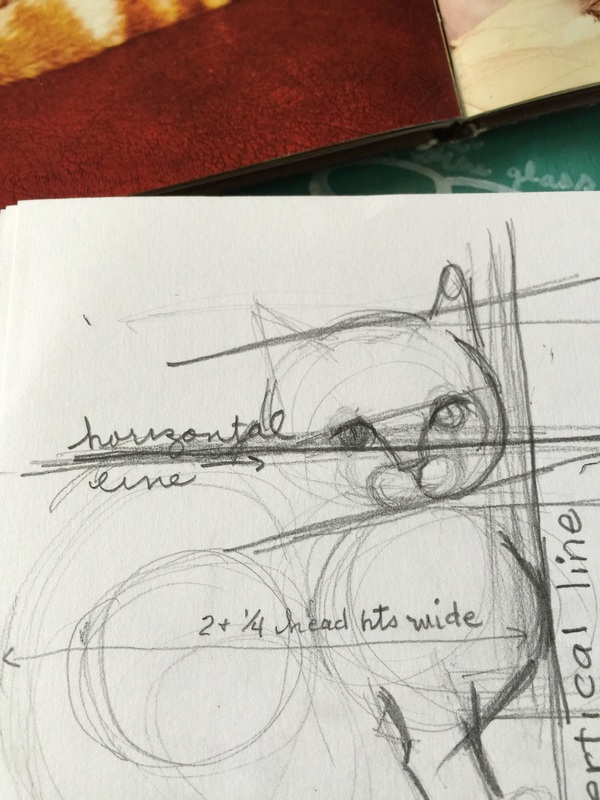 Then I used drew guidelines (picture below) to find the angles of the cat's head and features. You can add more guidelines if you find them helpful. They are a little humiliating at times because they can point out where our drawing is off, but that doesn't mean our drawing is wrong at all. It means we have another tool passed down to use by age old artists to make accurate sketches. No one sketches perfectly by sight. The experienced artists I know, use these guidelines to shape up their work. A good teacher is in touch with her students learning emotions and gives them encouragement when they are frustrated or stuck. So if you are feeling like this is a lot of stuff to know about and might want to quit. Please don't, just continue practicing and these concepts will become 2nd nature to you and your drawings will improve. Here is this weeks assignment.